Hiroshima Mayor Kazumi Matsui opened his speech by describing the hellish scene of the blast that morning 73 years ago and the agony of the victims, telling the audience to listen "as if you and your loved ones were there." Then he raised concerns about the global rise of egocentrism and tensions, and urged Japan's government to take more leadership toward achieving a truly nuclear-free world. "Certain countries are blatantly proclaiming self-centered nationalism and modernizing their nuclear arsenals, rekindling tensions that had eased with the end of the Cold War," Matsui said, without identifying the nations. Nuclear deterrence and nuclear umbrellas are "inherently unstable and extremely dangerous" approaches that seek to maintain international order by only generating fear in rival countries, he said, urging world leaders to negotiate in good faith to eliminate nuclear arsenals instead. The U.S. attack on Hiroshima killed 140,000 people, and the bombing of Nagasaki killed more than 70,000 three days later, leading to Japan's surrender and ending World War II. Matsui said in his speech that Japan's government should do more to achieve a nuclear-free world by helping the Treaty on the Prohibition of Nuclear Weapons take effect. Japan, which hosts U.S. troops and is covered by the U.S. nuclear umbrella protecting it from attack, has not signed the treaty. Japan should live up to the spirit of its pacifist constitution to lead the international community "toward dialogue and cooperation for a world without nuclear weapons," Matsui said. 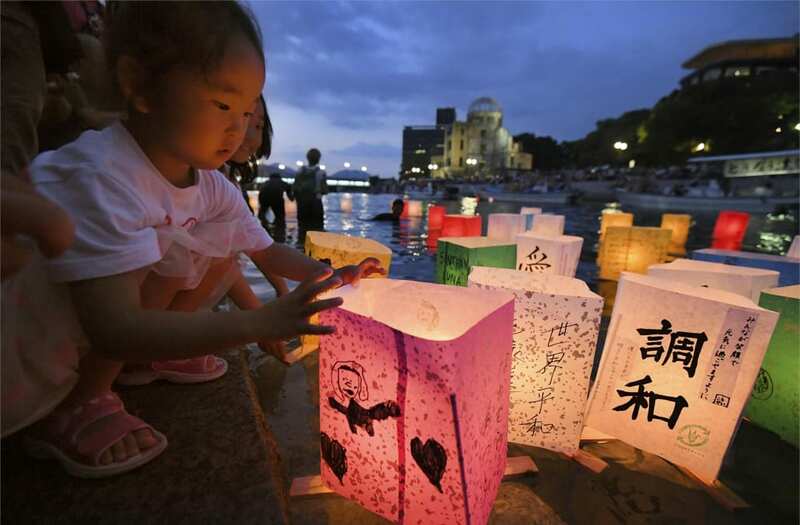 About 50,000 people, including Hiroshima residents and representatives from 58 countries, including U.S. Ambassador William Hagerty, attended this year's ceremony. The anniversary comes amid hopes to denuclearize North Korea after President Donald Trump and North Korean leader Kim Jong Un made vague aspirational statements of denuclearizing the peninsula when they met in Singapore in June. "We in civil society fervently hope that the easing of tensions on the Korean Peninsula will proceed through peaceable dialogue," Matsui said. Japanese Prime Minister Shinzo Abe, who also was at the ceremony, said differences between the nuclear and non-nuclear states are widening. But he pledged to do more to bridge their gap. In order to gain cooperation from both sides, it is important for everyone to understand "the reality of the tragedy of nuclear attacks," he said, reiterating Japan's pledge to maintain its pacifist and non-nuclear principles.